How big is Key West? What is the population of Key West? What is the Conch Republic? What should I do while I'm in the Keys? Key West is the last island in a chain of islands extending southwest of Miami FL that one can drive to. Key West is 159 miles SW of Miami and 90 miles north of Havana. To get to Key West, upon arriving at Miami, jump on US1 south, and drive!!! Optionally, you could fly into Key West International Airport (EYW). It is serviced by Comair: The Delta Connection, USAir Express, and American Eagle. Key West is further south than Nassau, Bahamas. ( Key West, FL 24.5 N 82.8 W). The island is quoted by several sources as being either a 1 mi X 3 mi island, or 2x4, or 3x5. The differences vary depending on if some adjacent islands are included, such as Stock Island, Fleming Key, and Dredgers Key. Just as the size of the island changes, so does the population. The 1990 Census listed the population of the City of Key West as 24,832. The population for the entire Keys (not all of Monroe county) is listed as 78,024. (Source: Key West Citizen -- Florida Keys Almanac, August 1994 derived from the 1990 Census). In 1982, the US Border Patrol placed a road block on US1 at Key Largo for the purpose of catching drug traffic, illegal aliens, etc. Traffic jams to and from the Keys built up in large proportions. Tourism basically died off. Several folks got together and formed the nation of "The Conch Republic", and seceded from the Union. The Conch Republic instantly surrendered to the United States and requested $1 Million in foreign Aid. The publicity stunt was successful in ending the road blocks. But to not let a good thing end. The Conch Republic Flag still flies in the skies above the Keys. Conch Republic passports are also issued. Cayo Hueso is Spanish for "Island of Bones". When Ponce de Leon first arrived at Key West, the island was littered with bones from the Indians who had lived here. The term "Key" is most likely an Anglicization of Cayo. It isn't clear if "West" is derived from Hueso (pronounced way-so) or if the term "West" has to do with the geographical location of Key West. Before I start answering these questions, there is a small amount of commentary that must be stated. Key West, and the Keys are a most wonderful place. They are so wonderful because of the natural habitat of the area. Our Coral Reef is one of the best on the planet to explore, but it is very fragile. Just touching the reef can cause measurable damage to the local ecological system. Captains and boat owners who run their boats around on the reef pay enormous fines for the damages. Respect the reef, the coral and other life out there. Throwing trash in our waters is even more damaging. Large fines are assessed to those caught littering the ocean. The fish you eat is caught in our local waters. Remember that before you let a friend toss a piece of trash into the water. As you drive through the Keys, remember that many endangered and protected species live here. The most noticeable is the Key Deer. When you approach Big Pine, speed limits drop and they are STRICTLY ENFORCED. As a side note, even at the speed limits, driving through Big Pine requires care. I was driving the required 25 MPH or less, when I rounded one curve. Two Key Deer were standing in the median. I slowed down, but as I passed the deer, one bolted. Luckily for me, the doe bolted the other way. Even though I was obeying the law, it could have all been over in the bat of an eye! What should I do while I am in the Keys? isit famous spots, such as Margaritaville Cafe, Kelly's (Kelly McGillis' place), Sloppy Joes, Hemmingway House, Audubon house, etc. Take either the Conch Tour Train or Old Town Trolley Tour. Jet Ski/Wave Runner/ParaSail/WindSurf or other similar activities. Bake at the Beach During the day/Party at night on Duval Street. Visit the various museums and attractions. Rent a bike and ride around the island. Many people chose to, park their car, and rent a Scooter or bicycle since parking can be tough to find downtown and at the beaches. 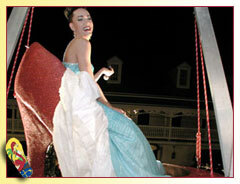 Fantasy Fest is an annual festival held in the streets and establishments of Key West. 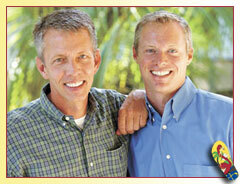 The Festival is best described as Key West's Mardi Gras. There are parades, wild costumes (to no costumes), music, dancing in the streets and so on. Fantasy Fest is held the last week of October, with the main events happening on Friday and Saturday of Halloween Week. Each year the Fest has a theme. 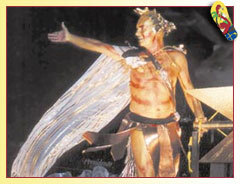 The 1994 Fantasy Fest was held Oct 24 - Oct 30 and the theme was "Mystical Myths and Twisted Tales". The 1995 theme is "Tinseltown Dreams ... Lights, Camera, Fantasy" which should produce quite an show. The 1994 Fantasy Fest lived up to everyone's expectations. Most all the restrictions placed on the 1993 Fest was lifted for this years festival. The estimate for the Twilight Fantasy Parade was over 55,000 people lining Duval and Whitehead.